Q. I am interested in an item on the website. How do I tell where my item is located? Q. I’ve found an item I would like to purchase. How do I proceed? Q. I really like this item, but cannot pay the full amount at this time. Are financing options available? A.Yes, Prop Store offers interest-free layaway payment plans. All we ask is 20% down as a non-refundable deposit on credit card with the balance settled over additional payments throughout the following two to six months. Your items will then be shipped on completion of the plan. *Should you decide to cancel the plan, any funds in your account other than the initial non-refundable, non-transferrable 20% deposit can only be used as a store credit. We do not offer cash refunds.cash refunds. Your store credit can only be used in the Prop Store office (London or Los Angeles) at which the payment plan was held. A. Prop Store accepts payment via credit card, check, or wire transfer. Credit cards accepted at this time are Visa, MasterCard, American Express, Discover (for LA office items only), Maestro (for London office items only), and Delta (for London office items only). Q. 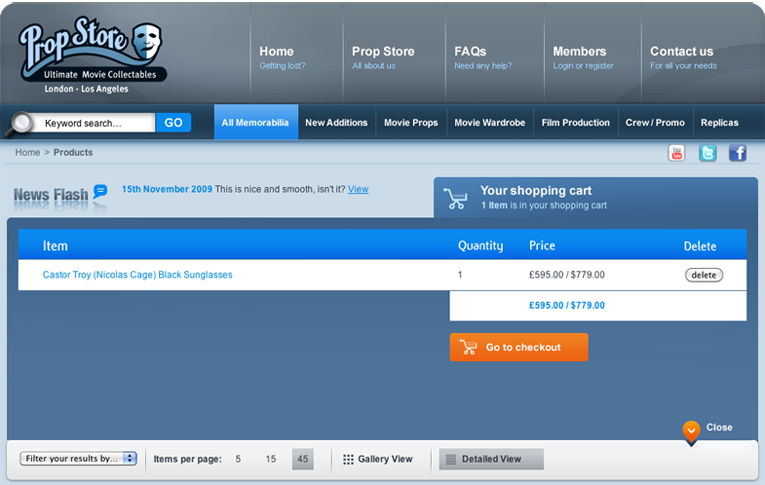 Why does each item show two prices – one in US Dollars and one in British Sterling? To clarify, an item that is in inventory at the London office will be charged in GBP, regardless of where the customer is located. An item that is in inventory at the Los Angeles office will be charged in USD, again regardless of the customer’s location. A. Prices for items held in our London office include 20% VAT (Value Added Tax). VAT will be applicable for any customers located in the EU. Customers located outside the EU will not be charged VAT, and thus the USD price of items held in the London office does not include VAT. Prices for items in inventory in our Los Angeles office do not include sales tax. Residents of California will be responsible for an additional 9.5% sales tax, on top of the price shown. Prop Store will not charge sales tax to residents outside of California, but customers should note that they are responsible for paying any applicable taxes in their own state of residence. A. Because nearly every item in Prop Store inventory is unique, we are unable to provide you with a shipping cost until you place your order. Prop Store uses only reliable, traceable shipping services, and will work with you to find the best option based on item sized and destination. After you place an order, you will receive an e-mail confirming the order and informing you of the shipping costs. For further information, please see our shipping page. Q. Why have I received two separate shipping charges? A. If your order contains items from both our London store and our Los Angeles store, then the order will be split into two portions. The London items will be charged and shipped from the London office. The Los Angeles items will be charged and shipped from the Los Angeles office. Q. I am concerned about import duty charges. Can you declare my package at a low value? A. Prop Store must declare all packages at their full value, and the buyer will be responsible for all of the import duties and taxes charged by their local government. We have spent a great deal of time researching harmonization (import & export duty tariff rates) codes, and use the most accurate harmonization codes to insure our packages pass through customs with as minimal duty and delay as possible. However, it is ultimately the customer’s responsibility to be aware of their own import costs. Q. Why is the amount charged to my credit card different to the advertised price? A. As previously stated, the London office charges all orders in GBP, and the Los Angeles office charges all orders in USD. If your credit card account is not of the same form of currency, a currency conversion will be performed by your credit card company, at the rate they are offering at the time. Prop Store has no control over this rate and any variances that may result from it. Q. I have completed the ordering process. Has my order gone through? A. You will receive an automated confirmation e-mail immediately from Prop Store with a subsequent email within one business day, confirming your order and the shipping charges. The order will then be processed, and your items will be shipped as soon as possible (typically the following business day.) Once your item has shipped, you will receive an e-mail from Prop Store with your tracking number. Q. Will my credit card details and personal information be secure? A. Prop Store uses secure encrypted servers for all of its web transactions, and keeps up to date with the latest in credit card security. Prop Store respects your privacy and will never divulge, sell or forward your personal information to anyone else. Credit card information is deleted from our system once the order has been processed. A. Simply log in to your account (link to member benefits page), and use the "Order History" tab to check the status of any current or previous order.